Best of the dishes get created when you are looking out for new ways to make the usual ones!.After thinking only of Dosas and Idlis for breakfast everyday, alternating with bread, we ran out of ideas. And on top with the boys refusing to touch Ven Pongal, we had no choice to think about. anything new It was almost like a threat that we were treated to. Both Peddu and Chinnu will come running to check what breakfast I was packing. I try to dodge most times, but I get protests from them in the evening and feel very bad. Thinking of what else can make a good breakfast, we though Vermicelli can be used in a better way. Of course the vermicelli upma was out of question. Nobody likes it though on the rare occasion I make it, it does get completed. It was then that Athamma said she wanted to try a different one. So finally came this dish into existence. Cooking Vermicelli as a pulao. When I told Amma, she said she had made this many times. I, naturally won’t know as I don’t look at any vermicelli dish. Most surprise was Konda loved eating the Vermicelli Pulao so much that she wanted it for school, which I packed for her. This not only gets done fast, it tastes really so very different. Why it is called pulao is because we used the same, well almost the same ingredients as in a pulao. Heat a non stick pan and dry roast the vermicelli till slightly golden. Remove and keep aside. Heat the pan with oil, add the whole spices, saute for a minute. Then add the slit green chilies and onions. Fry till the onions are turning colour, add the ginger garlic paste. Cook till the paste is well done. Then add the tomato and salt. cover and cook in sim till the tomatoes get soft. Then add water. Bring to boil. Simmer and slowly add the roasted vermicelli. Mix everything well and cover with lid. Stir in between to mix. Let it cook till done. Finally garnish with roasted cashew nuts and coriander leaves. Notes: I used a very thin vermicelli. Water ratio depends on the thickness and how gooey you want your pulao. Increase the spices as per taste for more spicy pulao. I made this a bit mildly for my daughter. The taste of the whole spices along with Vermicelli was fantastic! Do try and let me know. Would love to hear how else you cook vermicelli. nice one dear and I think I like the thin one compared to the thick one. 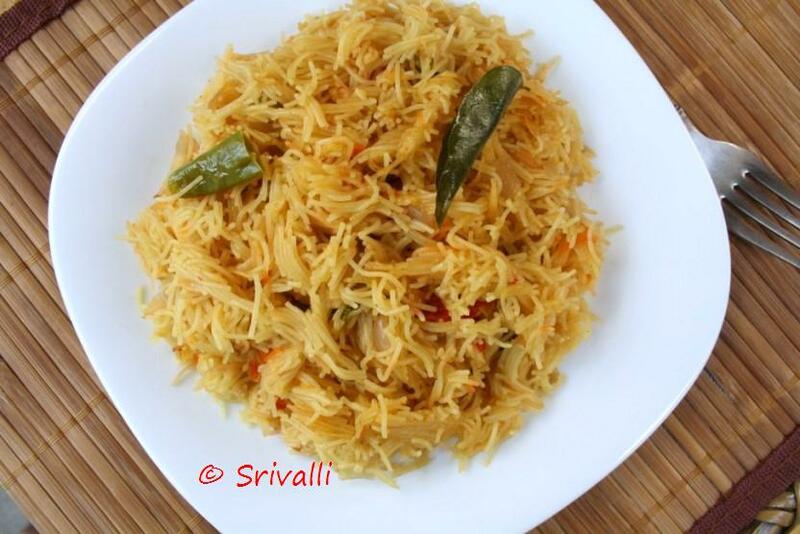 Pulav with vermicelli sounds delicious Valli..
wow.. nice pulao.. looks yummy..
yes…breakfast is a meal where it does get repetitive. I am always on the lookout for new breakfast recipes. Thanks for this one!